“Toulouse-Lautrec and Jane Avril – Beyond the Moulin Rouge”, an astonishing exhibition at the Courtauld Gallery, unveils the relationship between the famous French painter and his muse. 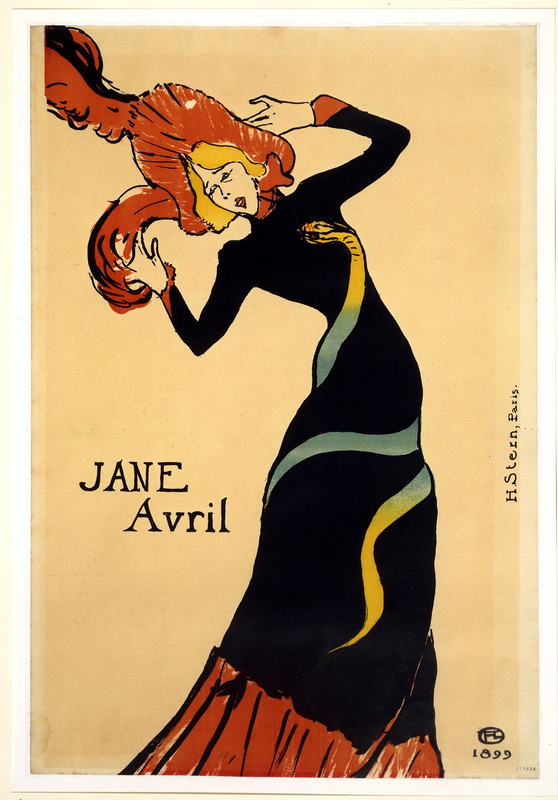 The dancer Jane Avril (1868-1943), in fact, was a great source of inspiration for Toulouse Lautrec. Born Jeanne Beaudon, she was one of the stars of the Moulin Rouge in the 1890s. Her notoriety was assured by a series of brilliant posters created by Henri de Toulouse-Lautrec (1864-1901) which enhanced her delightful trend and out of the ordinary charm for which Jane Avrilwas acknowledged.”Toulouse-Lautrec and Jane Avril: Beyond the Moulin Rouge” highlights the strong relationship between the two different artists: the member of one of France’s oldest noble families, Toulouse Lautrec, and the daughter of a courtesan, Jane Avril.The Courtauld Gallery exhibition brings together a variety of paintings, posters and prints from international collections focused on the sparkling bohemian Paris. Nicknamed ‘La Melinite’ after a powerful form of explosive Jane Avril suffered an abusive childhood. At the age of thirteen she ran away from home. Suffering of the nervous disorder commonly known as St Vitus’ Dance, aged fourteen she went into the terrifying Salpêtrière mental hospital in Paris, spending 18 months there. At one of the bal des folles, the fancy dress balls the hospital organised for its patients, Jane Avril took her first dance steps and found both her cure and her vocation. For “Toulouse-Lautrec and Jane Avril: Beyond the Moulin Rouge” new researches ad hoc made show the connections between her eccentric movements and contemporary medical theories of female hysteria. Her experiences helped defining her public personality and, as a performer, she was also known as ‘L’Etrange’ (the Strange One) and ‘Jane La Folle’ (Crazy Jane). Aged twenty she began to work for the Moulin Rouge as a professional dancer, adopting the stage name Jane Avril (suggested to her by an English lover). She was resolute to become a star in the flourishing world of the Montmartre. “Toulouse-Lautrec and Jane Avril: Beyond the Moulin Rouge” explores these different public and private images of Jane Avril. She became an icon of the bohemian Paris pictured by Toulouse – Lautrec as an environment of dancers, cabaret, singers, musicians, painters, writers and prostitutes. Catalyst of this period and environment was the Moulin Rouge. Opened in 1889, it offered customers a nightly programme of performances by its scheduled stars. “Toulouse-Lautrec and Jane Avril – Beyond the Moulin Rouge” is epitomised by the remarkable ‘At the Moulin Rouge’ (1892-93) an exceptional loan from the Art Institute of Chicago. 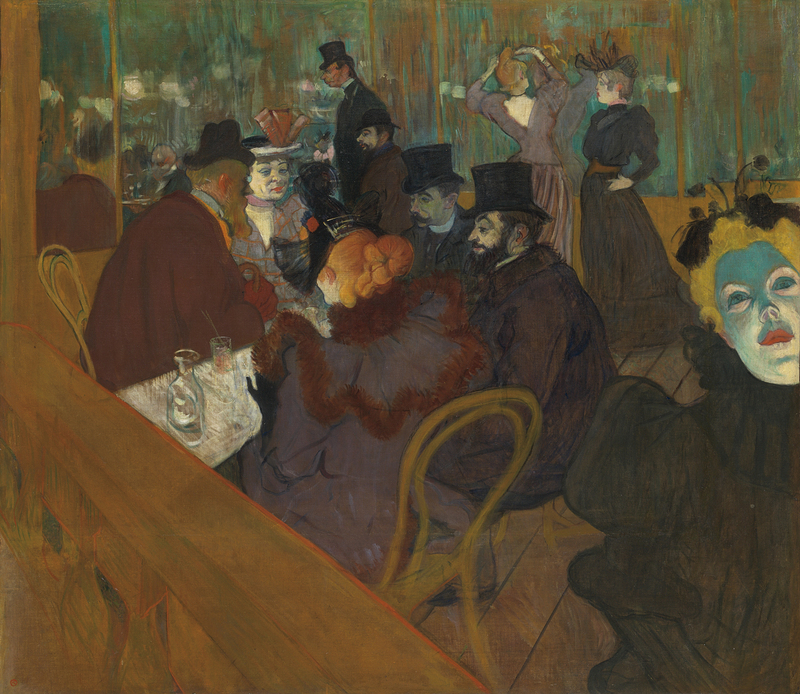 It is one of the Toulouse-Lautrec’s most celebrated paintings a homage to the venue but also an epic portrait of the artist circle of friends. Jane Avril is pictured from the rear and identifiable by her red hair. There are Édouard Dujardin, dancer La Macarona, photographer Paul Secau and Maurice Guibert. The woman in the right foreground is Mademoiselle Nelly C. Spotted in the background on the right the immoral La Goulue (The Glutton) and left Lautrec himself and Gabriel Tapie de Celeyran. The face of May Milton looms into the canvas.